Quantum SCIO Wellness Ltd is dedicated to give you the latest and best complete Quantum Information. We pride ourselves in knowing that we offer full support. This includes practitioner where abouts, excellent training for your Eductor and SCIO Device and more. Please know that at any time, you can call us, email us, and ask questions. Do please read about the Eductor our latest Twenty first CenturyTechnology. What are the Eductor and SCIO Devices? The Eductor and the SCIO coordinates a complex electro-modal, biofeedback program with computer software in order to gather Bioenergetic information of a client's subconscious. The information is gathered from the body through electrodes in head and limb straps. 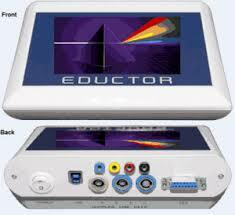 The Eductor and the SCIO measures evoked potential reactions of the client to applied stimulation’s. Within approximately five minutes, the Eductor and the SCIO Biofeedback System can detect and record information about the individuals stress reactions. This can then be read on the computer screen. A picture of the client's general status is indicated. The information can be further analysed in the course of a stress management session. Every therapy at your fingertips. All you need to get up and running with your new Device. The International Academy for Quantum Training offers Anatomy, Pathology & Physiology, Eductor and SCIO Training. Certification can include ITEC, IAQT, NBCB, NTCB and IMUNE. What to expect at a Quantum Device Consultation. Quantum Scio Wellness Ltd offers Sciowellness Health Screening Technology with Biofeedback Health Screening.